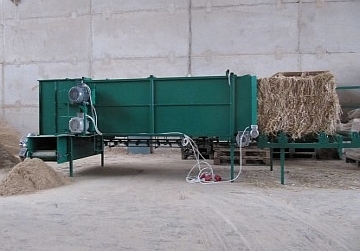 The bale breaker or separator is equipped with a bale feeder. It is designed for shredding and separating straw, hay and similar materials that have been pressed into bales. Depending on the screens used, the pressed bales are shredded into material suitable for bedding, for pelleting or briquetting. The finished size of the material can be set up and adjusted by using the appropriate changeable screens. To achieve straw grinding, the bale breaker can be equipped with a cutting/grinder that is sold separately. The bale breaker's productivity depends on the moisture of the milled material, the size of the bales, the type of milled material and the sieves used.